Our final second round match of Bracket Five of Battle of the Books pits A Guile of Dragons by James Enge against The Testament of Jessie Lamb by Jane Rogers. The winner will be the book I (Aaron) most want to continue reading after 50 pages. A Guile of Dragons: Pyr trade paperback, August 2012, 264 pages, cover art by Steve Stone. A Guile of Dragons reached the second round with a win over City of the Fallen Sky by Tim Pratt. The first 25 pages of A Guile of Dragons showed the circumstances of the birth of Morlock Ambrosius, hero of all of James Enge's books to date, whose mother betrayed his father Merlin. The second 25 pages show us the early life of Morlock, as he is raised by dwarves fiercely loyal to Merlin, although Morlock seems to feel nothing but resentment for his absent father. The first 50 pages end with Morlock being engaged by Merlin's old nemesis Earno to guide him across the northlands where the dwarves dwell. The Testament of Jessie Lamb: Harper Perennial trade paperback, May 2012, 240 pages, cover photo by Clayton Bastiani. The Testament of Jessie Lamb got here with a first-round win over This Case Is Gonna Kill Me by Phillipa Bornikova (aka Melinda M. Snodgrass). 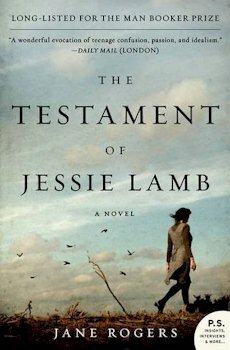 The Testament of Jessie Lamb is the memoir of the title character, written from captivity at the hands of her father. In the opening 25 pages, she told us of the spread of the MDS virus, which kills any woman who becomes pregnant. In the second 25 pages, she recalls her involvement with a post-MDS youth movement, the idealism and (arguably foolish) enthusiasm of which contrasts with Jessie's father's cynicism. We also learn that, while there remains no cure for MDS, doctors have learned how to induce a coma in pregnant women in order to save the babies. The Battle: This battle pits a high fantasy against a near-future science fiction novel, both focusing on a teenaged protagonist who does not understand his or her role in the sweep of history. I have no complaints about the writing in either book, but in both novels the significance of events in the characters' early lives is not immediately apparent. The battle comes down to which author nevertheless gets me involved in the main character's story. 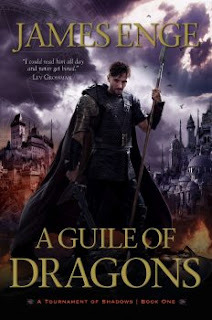 A Guile of Dragons is well-written and easy to read, with plenty of vibrant details. Through 50 pages, however, there is little dramatic tension; the whole affair has the feel of an extended prologue to the other Morlock Ambrosius books. Reading this opening section does not make me feel especially compelled to continue with A Guile of Dragons, altough it does leave me very interested in checking out Enge's first novel Blood of Ambrose. But looking back, if I hadn't done all that——the meetings and arguments and petitions and demonstrations, the hours hunched over the computer——if I hadn't done all that in good faith, and then been so totally frustrated——then maybe I would never even have found the next thing to do. If I'd never felt the thrill of imagining we could change things——perhaps I wouldn't have looked for it again. At the end of this section, I am very interested to learn what decision Jessie has made and how her relationship with her father has so completely broken down, and I want to read more. The Testament of Jessie Lamb moves into the semifinals, where it will face Nightglass by Liane Merciel.